The past few months have seen me try to increase my running at the expense of my cycling. Comparing my overall mileage for the year, I’m probably on the lowest distance to date since 2011. However, the running has improved and I’m hitting personal bests that I set whilst I was running during university. I have tried to maintain the cycling at least once a week though, cycling to work. Recently, I had to slow the running down (I had to stop running altogether for three weeks) to recover from some shin splints. During that time, it was time for me to re-evaluate the cycling. 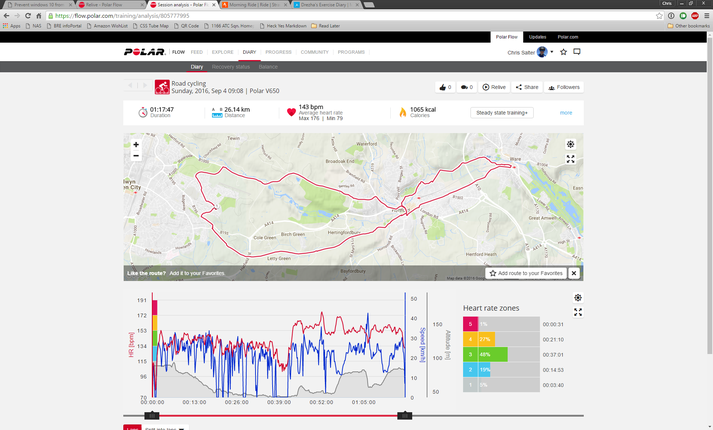 I might not be able to cycle as often, but I needed to be able to cycle smarter - and that meant training using a heart rate monitor. It’s been a few years since I’d worn a heart rate monitor - I used to use one when I first started cycling but it was just really for extra data whilst riding, I didn’t really use the data to assist in my training. However, with the time I’ve got, I need to start improving my fitness using all the tools at my disposal and that includes a heart rate monitor. The issue I have is that I purchased a Garmin Touring GPS device in the past - as I went for the base model, mine doesn’t support heart rate monitoring. In general, that’s not to much of an issue, as my Vivoactive can record bike rides and will do heart rate as well, but it’s not ideal. The Vivoactive doesn’t seem to be as accurate as the handlebar mount GPS devices and it meant that I would have to keep a close eye on it’s battery whilst cycling to and from work (and other rides). So I started looking at various Garmin units to replace it - perhaps getting one without mapping, but would support ANT+ sensors, such as heart rate. The cheapest Garmin, the Garmin Edge 20 seemed to fit my bill and was relatively cheap. However, I carried on looking to see what the other options were. I’d heard of Polar previously, but I’d not used any of their products. I can’t recall how I came across it, but in my searches for a Garmin, I came across the Polar Cycling GPS units and went looking at them in a bit more detail. 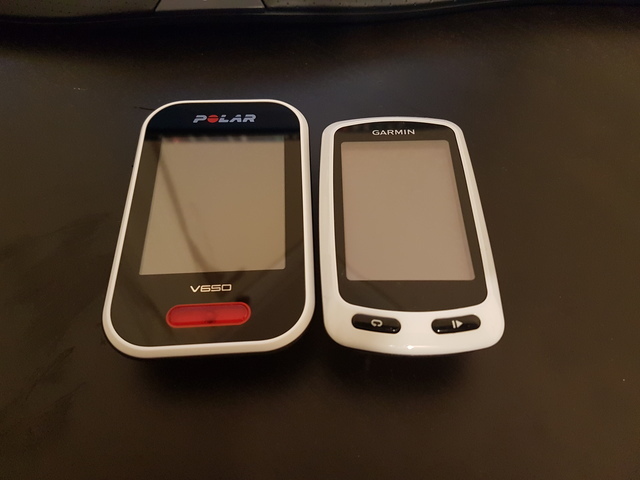 There are currently two offerings that Polar offer - the M450 and the V650. Both devices record heart rates (using a Bluetooth strap though - not ANT+ sensors here) so fitted the bill, but the V650 also included mapping. Whilst I didn’t think I needed maps anymore, it’s a nice feature to have. The reason that swung me to Polar was the fact that the devices were much cheaper than the Garmins. I picked up the V650 for £133 from Evans Cycles in a sale - this was only slightly more than the Garmin that I was initially looking at! The V650 is probably about the equivalent to the Garmin 810⁄820 with perhaps a few less features (though more than the 510). 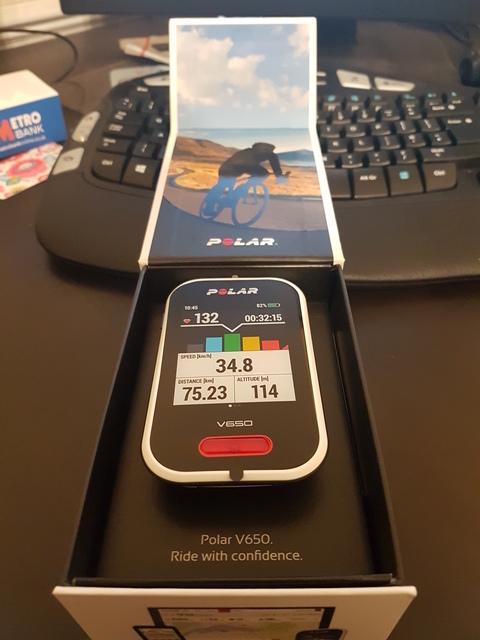 To get the V650 setup, I needed to download the Polar Flow sync software, which only works on Windows and Mac - and you can’t access the file system of the GPS like you can on the Garmin, so you can’t use this device with Linux. As I’ve got a Windows machine, this would be fine (and presumably you could use a Windows virtual machine). However, it does mean that I cant use it with my laptop as this runs Mint Linux, other than to charge it up. 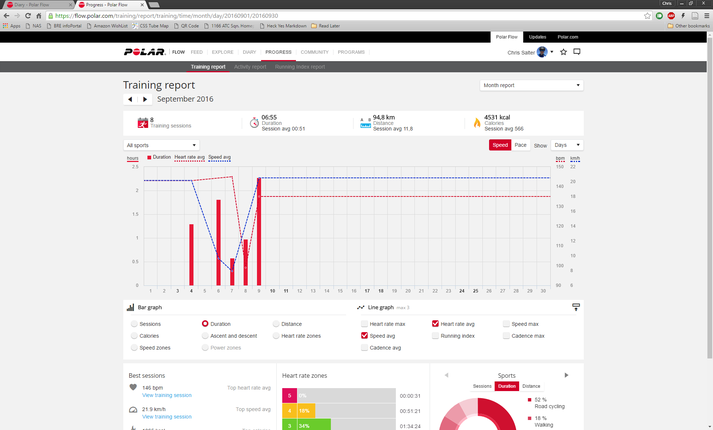 As the Polar Flow Sync program uploads all the data to the Polar Flow website, you have to be comfortable with Polar having access to your data - this may put some people off if they would prefer to have a local copy of their training without it being put on the internet. You can however set the privacy to private, so at least no one else would be able to view it. The setting up of the device can be done on the Polar Flow website or on the device itself (it’s easier online). The device charges and syncs with a microUSB cable - one was provided but I’ve got plenty of these lying around the house and this plugs into the back of the device, similar to the Garmin range. There is no option for a microSD card for maps - maps are downloaded via the software. The device can “only” fit a 450Km x 450Km square maps onto the device at any one time and this is done by selecting the centre of the area you want covered on the map and then using the Polar software to sync. This will then download the data from the Polar website and store on the device. I believe that this makes it easier to download and setup, you do rely on Polar having the data available and up to date (though it is based on Open Street Map data). The maps are well laid out and in use, I found it to be better displayed on the V650 than the Garmin Touring (and 800 that I used to have) - this is probably down to the base maps being used, but the Polar ones display the information I need. To upload files to follow, you need to (oddly), add them to your favourite tracks on the Polar website where you are able to upload GPX and TCX files. These are then downloaded down to the V650 when you sync. The Polar website does not allow for creating a route and so you would need to create new routes elsewhere before uploading them to the Polar site. Some criticisms I’ve seen online of the device say that it’s not any good for those doing sportives as you cannot import the route files - these people have not really dug into the settings or read the support site, as this is described there (as I had to search the Polar support site to find out how to do it!) However, once you’ve uploaded it, it appears on the V650 once it’s been synced and you’re ready to go. To ride a route, you select the route within the favourites menu and then select it. This creates a new map screen that shows the route as an overlay on the map and you follow the breadcrumb trail. Before getting one, I joined the Polar Flow website - the equivalent to Garmin Connect or the Fitbit Online pages. This let me have a look around before purchasing the V650. I didn’t get much out of it prior to getting the device, but it all made a lot more sense once I’d done my first training ride. In terms of usability, it leaves Garmin Connect in the dust. Since Garmin moved to the multiple widget layout, I stopped using it. The layout is appalling and pretty hideous. Finding information was a lot harder than it needed to be and just in general was a pain to use. I ended up just using Strava for everything. I’d only use Garmin Connect on my mobile and that was purely for looking at stats for my watch. Uploading a ride is all done via the Polar Flow program or via the Polar Flow app on your phone. Either way should upload your activity. On the computer, the Polar Flow website will open after the ride has uploaded. 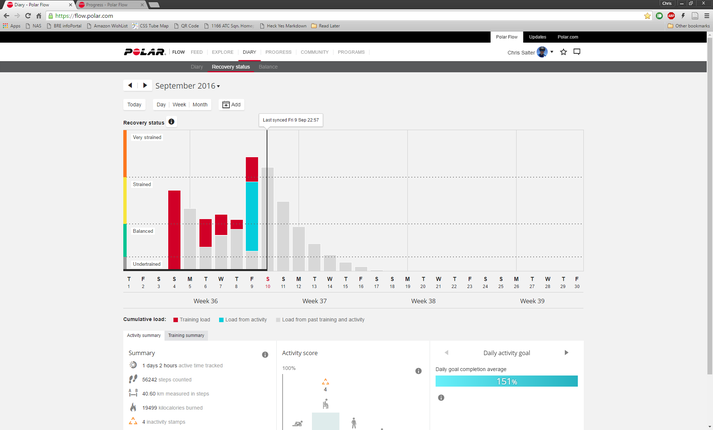 The activity page has everything that you would need on it - graphs of heart rate, speed, distance, gradient etc. 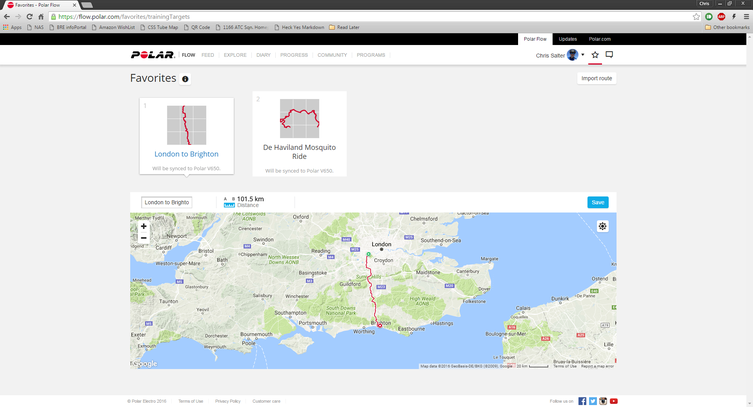 It matches the information that you would get from the same ride on Strava or Garmin. In fact, Polar has auto export to Strava (which I’ve found works almost instantly) allowing you to use it alongside Strava. All the information you might want is present. You can also export the ride for other services - normal exports apply (TCX and GPX files) but it also offers a CSV file and you can also download the three different files in a ZIP file if you want to download them but save space. One of the features that the Polar site has that I’ve not seen on another site is the Progress and the Recovery Status. The progress page is designed to show you the progress in a specific sport - such as speed or drop in heart rate for the same ride or similar. It’s an interesting page, though by default it’s fairly silly as it combines all sports on to one graph so is essentially useless - until you start messing about removing the other sports using the drop down box. It’s supposed to show how you’ve improved. However, unlike Strava, Polar doesn’t allow you to mark rides as commutes and therefore you can’t remove rides that you might not want included. So in effect, whilst it’s an interesting page, I don’t see it being of much use. The Recovery status is an interesting page and this one would appear to be of more use than the Progress page. Every ride, run or activity you do puts stress on the body. The Polar website tries to take all your rides etc and show how the ride has effected you and tries to show the stress your body has been under and how long it’ll be until you should do more activities - the idea being to prevent over training. I’m not 100% sure how accurate it is - from the FAQ’s on the Polar site, it’s based on your previous data, so I’m hoping that it will improve as time goes on. I think it could prove helpful, though the best method of seeing if you’re over training I guess is to listen to your own body! Whilst that’s the case, it does prove handy to look into it. My only issue with it is that I believe it’s based on time and heart rate - so when I go to the gym and do a weights session, the next day, I can occasionally barely lift anything light but the recovery status shows that I could go out and smash a PB or similar and that’s just not the case. I guess for aerobic sports it’s probably not to bad, but it doesn’t seem great for weights. The V650 is supposed to be able to sync via Bluetooth to a phone. I’ve had mixed success. It’s synced a couple of times on my Samsung S7, but then occasionally it hasn’t - yet trying it with my work iPhone 5S has had it sync no trouble at all. It seems that the most straight forward way is to use the computer and have it sync that way! Comparing the V650 to the Garmin Touring, the unit itself is bigger and also has a bigger screen. I think that the V650 screen is better than the Garmin one itself. Colours seem to be easier to distinguish, useful for the graphs that the computer displays. Just like the Garmin, the V650 has a number of different screens and you can change the information that each screen shows. There are limits to the number of screens that you can have and you can’t remove the maps or heart rate screen. However, part of the reason I got the device was for both of these screens so that isn’t to much of an issue. The Garmin has a compass screen which I always turned off as it was fairly pointless in my eyes. The Garmin has better control - think of the V650 as an iPhone and the Garmin range as Android phones. You can access almost everything on the Garmin just by plugging it into the computer. This gives a lot more freedom and flexibility but at the risk of deleting important data. However, the Polar, like an iPhone, does not offer any access to the filesystem and can only be accessed via the Polar Flow app (akin to iTunes). Once the data is on the Polar Flow website though, you can export it and upload to other services as much as you like so that isn’t an issue. Support for accessories is less widespread than for Garmin. I’ve ended up buying a small third party mount for the Brompton that would let me use the enclosed Polar mount point without the stem bolt of the Brompton getting in the way. I also found a third party mount from eBay that’s the same as the Polar out front mount. I struggled to find the Polar out front mount in the UK, though I have found a UK shop with it now it stock which I’ll consider ordering. Overall, I’m happy with my purchase. At a basic level, the V650 gives good data whilst out riding for those that are interested in speed, distance etc. The heart rate monitoring is better than I’ve found within the Garmin range, though the only potential metric that would be good is a heart rate zone data field (there may be one, but I can’t check at the minute) which would allow easy checking of the effort you’re expending. However, the heart rate graph page shows that information well enough for me and also features two additional fields so you can change those to suit as well. The mapping functions are fairly good. Garmin beats it in terms of navigating as it can re-direct you back to where you’ve gone wrong, but the breadcrumb trail does do the job. The route can occasionally get lost in the map though as it’s a small red line - I found that on one ride I had to look more closely at the map than I might like to spot the route, but in general it was fine. It’s performed nicely so far and I look forward to using it more in the future.